Update: The archive is available for viewing! Check out the ninth part (Of episode 1?) of Sonic Fights Robotnik. Featuring Bartman3010, David the Lurker, Instant Sonic, Kat, Overlord, Shadix, Perfect Chaos Zero and HarroSIN as Duke Nukem as well as special guests Andross a.k.a. Dom, Adam and Dare! Also features the first half of an adaptation of Sonic Boom! What could possibly go wrong? Live from Robotnik’s TV Station, Sonic Fights Robotnik enters round eight nine! (Sorry David!) Featuring more superfluous characters, explosions and more of Sonic fighting Robotnik written by sonicfan. Starring the Sonic Retro and SEGAbits crew with special guests. This episode is brought to you by The Robotnik Show™. Sonic Mania still has a way to go, but we’re already getting merchandise rolling in with limited edition T-shirts available through Amazon. These shirts are available for a limited time only, until the end of the month, sporting two designs for both US and UK regions. Both shirts come in a set of colors for men and women of multiple sizes. One features a beautiful poster-esque image of Studiopolis and the other featuring profiles of Sonic, Tails and Knuckles; the triple threat. Oddly enough, the triple threat shirts appear to be different between regions, with the UK version sporting the Sonic Mania logo, and the US one featuring just their heads. 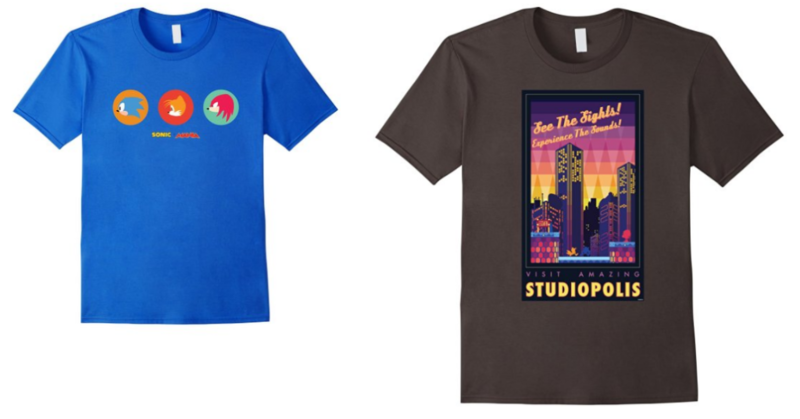 Gorgeous designs they are, although I’m holding out for a poster of Studiopolis myself!